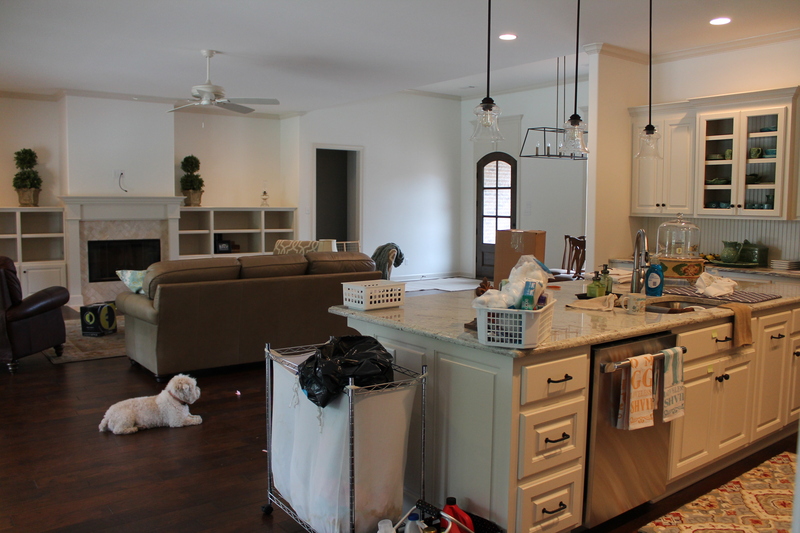 We moved into the newly constructed home before it was quite finished. That’s what rain and ice storms will do to you! The first week in the new house was hectic. I felt like I was living with the electrician, the trim guy and the landscape crew. Every attempt to clean or unpack a box was interrupted by the ringing of the doorbell or an onslaught of questions, all in desperate need of immediate answers. Not to mention, it was the next to last week of summer for my girls (currently 15-yes they are twins) who of course expected to be in full summer mode visiting with friends, hosting pool parties etc… Just about the time I thought it was all beginning to get a little under control, the bottom fell out. I mean, the skies let loose and we had day after day of rain. I am not talking nice summer rain that sends you to your favorite chair to curl up with a good book. No, I am talking black skies, lightening, and rain that comes down in buckets. The newly laid sod began to shift. The fresh topsoil paid for and brought in by truck began to slide out from under the sod, from underneath the newly installed wood fence, and down the hill it went. My heart sunk. Where once a fence stood firmly planted to keep critters out and dogs in, lay a hole. A hole big enough for both my dogs to fit right through. A hole big enough for the raccoon to get back in and sachet around the pool and check out my new patio chairs. It wasn’t good. It wasn’t pretty. As I sat the next morning in my quiet spot pondering, journaling and needing desperately to be able to focus on my bible reading, the sinkhole caught my eye. (in all honesty you really couldn’t look in the backyard and miss it) I realized in that moment how often God must look at me and see me as a sinkhole. I plant myself in His word and begin to grow. Then something or someone comes along and I get distracted, overwhelmed or even just get myself all in a tiz (as my grandmother used to say). All that rich blessing of instruction and wisdom I had been taking in just slides right out from under me and I find myself in a pit, a sinkhole. No roots, nothing sustaining me. How frustrated He must get. How often He must shake His head. Fortunately He is a God of mercy and sustaining grace. He brings to me more rich teachings, more wisdom, more opportunity. He sometimes does it through others. Sometimes it is His word alone. Sometimes it is a convicting message on the Christian radio station. He gives me yet another chance to stay planted, grow roots, deep and wide, just as with our grass which has been pulled up, fresh topsoil put down, the sod relaid and gently watered. Given a little time, a little perseverance and discipline, I find my footing, dig deep the roots. This doesn’t mean I’ll never have a sinkhole again. It just means the next time maybe I won’t sink quite so low. My roots will be a little deeper. I’ll know exactly what I am holding on to. There are still sub-contractors in and out of my house. The unpacked boxes are still around (the pile has diminished substantially!) and there is still evidence of the sinkhole. But things are coming together. Each day is a new day, another day to work on a box, decide where to hang a picture. It’s another day to live, to create memories in this new home, to set down roots.